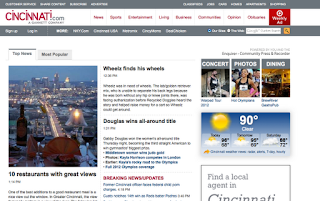 If the Cincinnati Enquirer web site were a person, relatives would be doing an intervention. It appears the site is trying to commit suicide. The home page is consistently visually dull, it is boring. A few weeks ago when a major storm took out power of millions of homes across the country, WCPO and WKRC and WLWT had home pages featuring the storm. That makes sense. That's obvious. That's the big story. That's visual. What did the Enquirer highlight? I AM NOT MAKING THIS UP. Leaping carp. Take a look. Today, it appears once again the Enquirer is trying to win the most boring news site web page in the world. Congratulations Enquirer, you're winning. Please, make it stop. Sometimes suicide does make sense. The Enquirer web site makes a first-rate argument for self immolation.